allows users to turn their personal computing experience into a shared computing experience. As a Table PC, Horizon can lie flat on any surface, lets two or more people use the screen at the same time, supports interactive physical gaming accessories and is designed for touch screen game-play among several players. Horizon takes advantage of Windows 8 touch functionality to bring customized games from Electronic Arts and Ubisoft to life in a way players have never before seen. Horizon can also easily transform into a 27-inch high-performance desktop to handle whatever productivity tasks users need to do. At the Consumer Electronics Show this week, Lenovo also today demonstrated a large 39-inch wide-screen Table PC, code-named “Gamma.” While still an early concept, Gamma illustrates the outstanding multi-user entertainment experiences such a large screen can provide and is indicative of Lenovo’s future direction in Table PC computing. 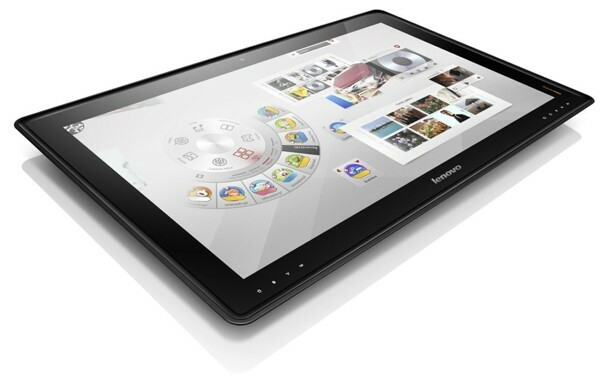 Enjoy painting and coloring in the Paint, Color Corner app or play contest games in Lenovo Best Guess With Horizon’s smart hinge system, users can easily lay it flat and in so doing, the Lenovo Aura multi-user, multi-touch interface will automatically activate. This simple UI lets families play, learn or enjoy multimedia content together on one screen. Aura also serves as a great way to launch pre-loaded gaming and educational apps or download new ones from the online app store. large backlit screen can be seen from virtually any angle and its NVIDIA GeForce graphics make content look gorgeous with smooth and seamless video playback, eye-popping graphics and heart-pounding Dolby Home Theatre v4 audio. To support such a command performance, Horizon is powered by Intel Core i7 processors. As an option, Horizon offers a moveable and space-saving Horizon Multimode Table. This adjustable table allows users to change the angle and height position of the Table PC, from lying flat to a straight-up, ‘wall-like mount’ at 90 degrees. Lenovo offers an array of protection services for the Horizon Table PC, including InHome Warranty upgrades for service at the owner’s home or business and up to three years of warranty coverage. Additionally, Lenovo Premium Support’s expert technicians are available when needed with convenient over the phone or remote session support from the comfort of home. partners and www.lenovo.com. Prices start at approximately $1,699.